The Qatar Exchange in the green area on Thursday adding 275.92 points (2.06%) advance to 13,694.19 points from 13,418.27 on Wednesday. 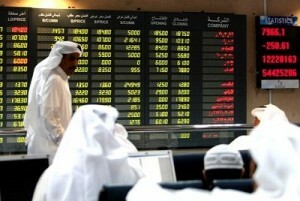 The volume of the shares traded up to 73,303,552 from 27,468,261 on Wednesday and the value of shares increased to QR4,274,465,846.78 from QR1,321,282,023.69 Wednesday. Among the top gainers were Commercial Bank of Qatar which was up 4.36% to QR71.80, Qatar Islamic Bank gained 7.18% to QR109.00, Qatar Insurance added 4.23% to QR78.90 and Electricity and Water up by 4.51% to QR203.80.